A classic pumpkin pie recipe whilst we can still get pumpkins! As autumn draws to a close and Halloween is officially over our window here in the UK for getting our hands on pumpkins is quickly closing. We don’t use a lot of pumpkin in cooking here, not as much as we should and after Halloween, they tend to fall out of favour. 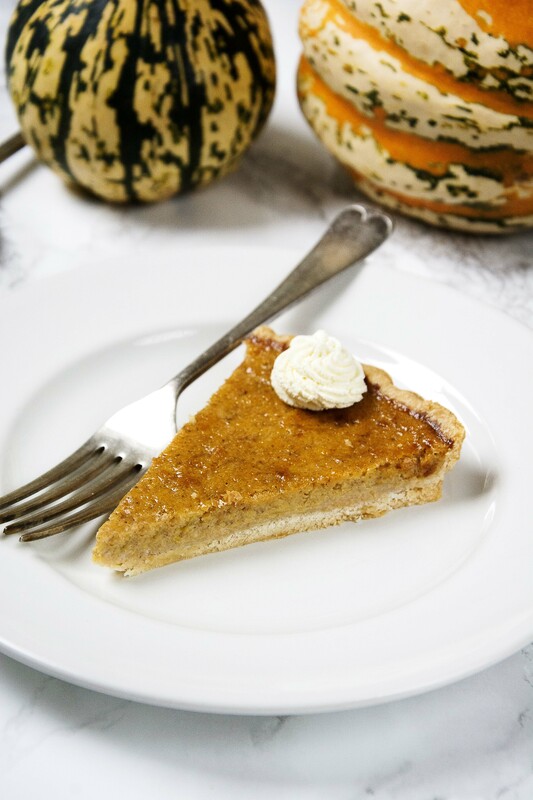 Here is a beautiful classic pumpkin pie recipe to savour the last of the pumpkins. 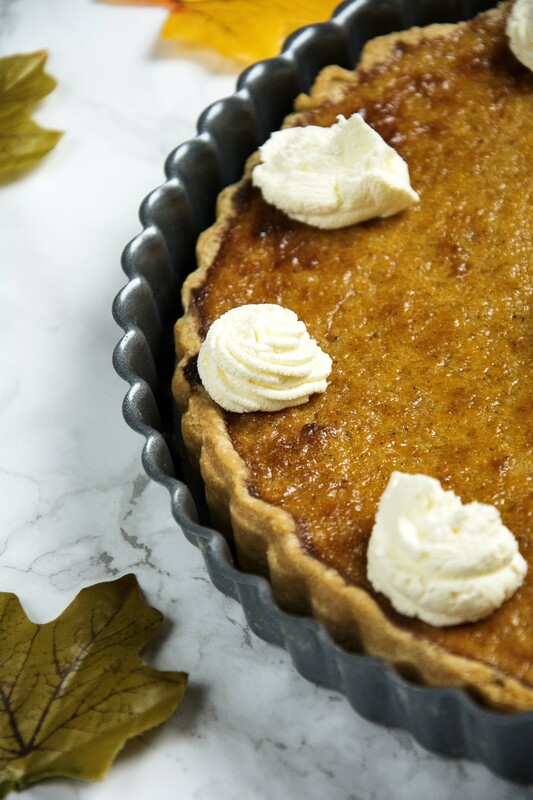 Pumpkin pie is a classic, creamy rich spiced pumpkin filling nested in buttery pastry and topped with whipped cream, it’s an absolute delight to the senses. But I have a question for you when using fresh pumpkin to make your pie, do you use the flesh or the innards? Sam and I had this discussion recently, he couldn’t understand why I was throwing away the seeds and the stringy gunk from inside the pumpkin. He was claiming his mum always made pumpkin pie from this. I couldn’t understand. how you would separate the seeds from the stringy gunk and b. how the stringy gunk would be enough to make a whole pie. And this got me thinking because I always waste the seeds and gunk, It would be great if it could be saved and used. So how do you make your pumpkin pie? 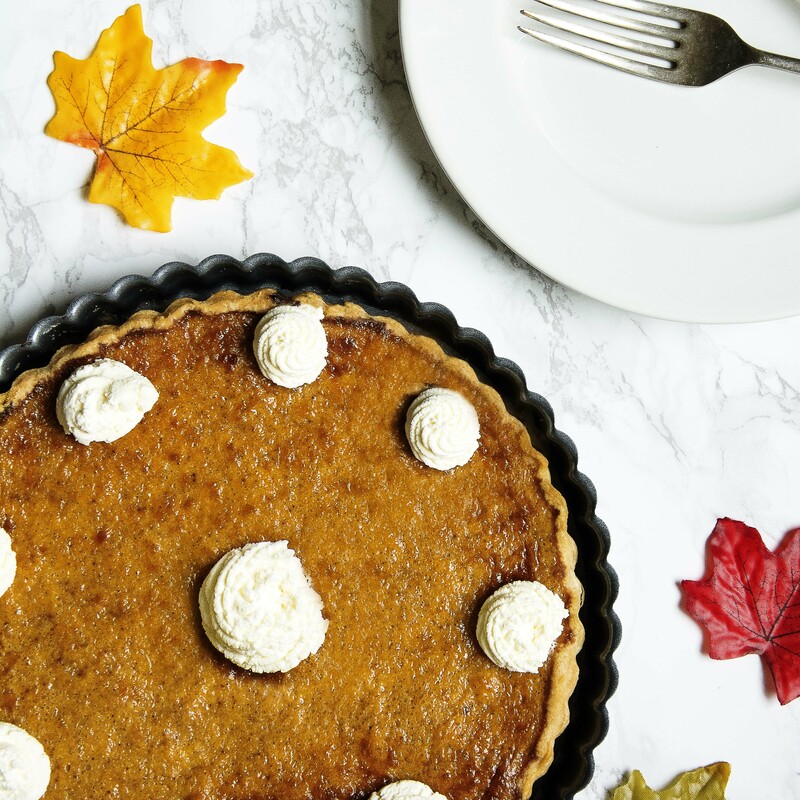 This classic American dish is traditionally eaten around Thanksgiving but it can be enjoyed throughout the whole pumpkin season. Try experimenting with the type of spices added, nutmeg, cloves or allspice would be a welcome addition to the traditional classic. Note: I use ready made pastry, feel free to make your own, or buy a ready made pie crust, whatever suits you. The pastry is easy to make for yourself but most of the time I don’t want to deal with the additional clean up. To make pumpkin puree, boil cubed pumpkin pieces for 20-30 minutes until soft, when cooked drain well and leave to cool to remove any excess water. When cool either mash very well with a potato masher or pop into a blender and puree. Transfer the puree to a fine sieve over a sink or bowl and leave to sit for an hour to allow any excess moisture to drip out. Store in your fridge until needed. 270g pumpkin puree, I use homemade but if you can get your hands on tinned feel free to use this. Pre-heat your oven to 180C, and lightly dust your work surface with flour. I usually use ready rolled pastry but if yours isn’t pre-rolled, using a rolling pin roll the pastry out so it is large enough to fit an 8″ round pie dish. Spray the pie dish with non-stick cooking spray. Using a rolling pin for help transfer the pastry to the pie dish making sure to press the pastry into the corners. Prick the base with a fork a few times and line with baking paper. Chill the pastry for 20 minutes in the fridge. After 15 minutes remove the beans and baking paper from the pie and return to the oven for a further 8 minutes. Remove after 8 minutes, the pastry should be cooked through. Reduce your oven temperature to 160C. Whilst your pastry is blind baking you can start on your pumpkin filling. In a bowl, add the eggs and using an electric whisk, beat until the eggs are pale and fluffy. Add the sugar, spices and your pumpkin puree and fold in gently. Add the evaporated milk and stir to combine. Pour the mixture into your pastry and return the pie to the oven for a further 45-50 minutes. When cooked the filling should feel quite firm. Remove the pie from the oven and leave to cool. You can serve the pie hot or cold with a generous helping of whipped cream. 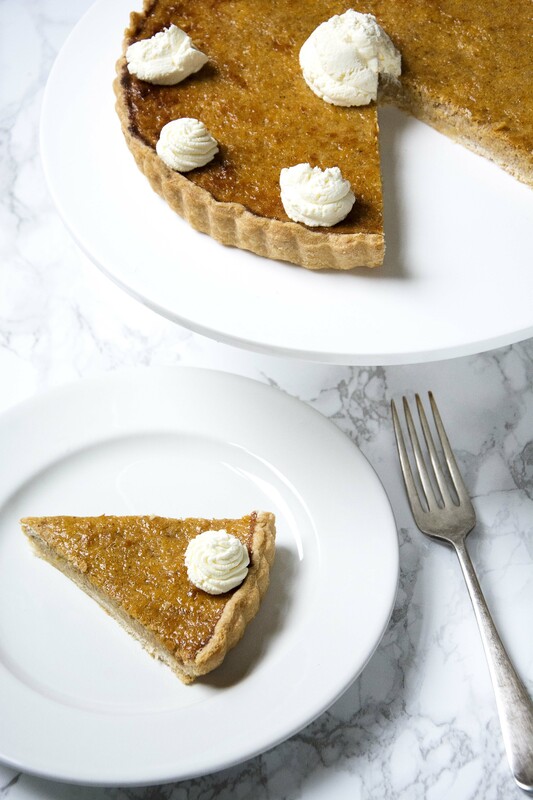 And there you have it, my autumn pumpkin pie recipe, get started on this quick before the pumpkin season is over and you lose the chance for another year! And if you do make this let me know how it turns out by tagging @whatseatingmanchester in your social media post!